A dark stormy night… Dr Anand (Manoj Kumar) comes across a mysterious woman (Sadhana) who takes him to a graveyard and vanishes. Soon his life turns upside down. His fiancé Seema (Helen) is killed, he agrees to an arranged marriage and the bride, Sandhya (Sadhana again), turns out to be the very image ghost he saw! As he battles to make sense of events around him even as he is losing his mind, the climax reveals identical twins and a convoluted plot concocted to cheat Kumar out of his substantial inheritance by rendering him insane! Raj Khosla was perhaps the most underrated filmmaker in Hindi Cinema. Having come to Bombay to be a singer, he became an assistant to Guru Dutt from Baazi (1951) to Aar Paar (1954) before making his first film, Milap (1955). Khosla’s strength was that he could easily shift from genre to genre while adding his own personal stamp to each of his films be it the thriller (CID (1956)), the social (Do Raaste (1969)) or the dacoit drama (Mera Gaon Mera Desh (1971)). Thus, his filmography has a variety seen in very few Indian filmmakers. Woh Kaun Thi? (1964) is the first and perhaps best of Khosla’s mystery-trilogy films with 60s icon Sadhana – the others being Mera Saaya (1966) and Anita (1967). The film is loosely adapted from Wilkie Collins’ The Woman in White, which even mentor Guru Dutt had tried to film earlier but, ultimately dissatisfied with the production, he had abandoned it. The ill-fated project, titled Raaz, starred Guru Dutt himself with Waheeda Rehman and Kum Kum and was to be music director RD Burman’s debut making film. Woh Kaun Thi?, though dated (today Sadhana’s Mujhe Khoon Pasand Hai dialogue comes across as plain corny), sees Khosla create a mysteriously adequate ambience from fog-filled nights to creaky doors to abandoned old houses right from its opening on a dark stormy night. He handles the suspense elements well to keep the film and its plot moving along at an engrossing enough level with enough red herrings thrown in to keep the viewer hooked on to the events unfolding on screen. Where the films fails, however, is the final denouement, which, when it comes, is pretty weak after all the build up. The film showcases Sadhana at her mysterious best as she goes through a range of enigmatic ‘Mona Lisa’ smiles to confuse the hero, a surprisingly restrained and consequently wooden Manoj Kumar. 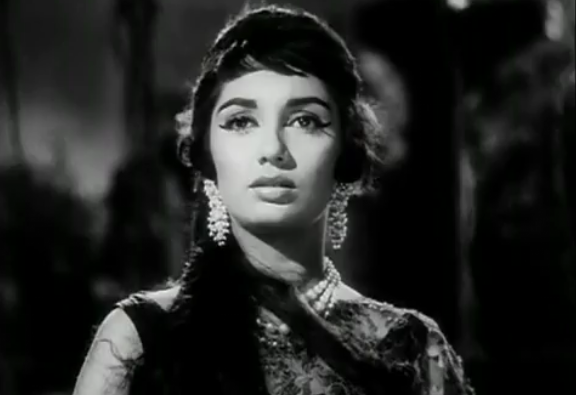 Sadhana’s biggest tragedy was that she was always looked upon as a fashion icon and filmmkers too exploited her for only for glamorous roles when, in fact, she was also quite a capable actress. She does leave a strong mark in Woh Kaun Thi?, both, with her looks as well as her performance as the good and evil twin sisters. In fact, the film is the first of ‘double roles’ for Sadhana, who would also play dual roles in among other films, Mera Saaya and Geeta Mera Naam (1974). It is to her credit that she makes the roles her own, especially as initially the project was conceived with Nimmi in mind. Today, Woh Kaun Thi? and Sadhana are synonymous with each other. On the technical side, special mention must be made of the extremely effective moody black and white camerawork by KH Kapadia, Kapil Divecha’s eerie audiography and Madan Mohan’s melodious music, easily one of his most memorable scores – Naina Barse Rhim Jhim Rhim Jhim, Lag Ja Gale, Jo Humne Dastan Apni Sunaayi and Shokh Nazar ki Bijliyan among others brilliantly composed and Khosla’s incredible song picturising abilites, in particular the picturization of Lag Ja Gale lift the film several notches. All in all, Woh Kaun Thi? 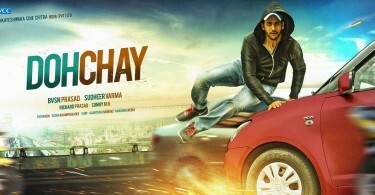 is easily one of the better crime thrillers seen on the Indian screen.